(yWeekend) "The Most Awesome Nailhouse" Gives Birth to "Citizen Journalism". By Chen Wanying (陈万颖). March 29, 2007. "Each section shall be around 15 words or so; the live photographs must include your own ID or logo; also stream or hyperlinked videos that show live arguments (but no speeches from government leaders)." In the case of the "most awesome nailhouse" of Chongqing, the netizens at Tianya, MOP and KDNet used everything that they could to report from the scene. In real life, they are animation designers, trade corporation employees, etc. Previously, in the cases of "Bronze Moustache gate" and "Female cat torture," the world saw the power of the "human Internet search engine" in action to track down specific individuals. Now the appearance of "the most awesome nailhouse" has given birth to "citizen journalism." Why are the citizen journalists doing this? What are they offering to the netizens in general? Why are they receiving these high hit rates? Our reporter tries to find the answers based upon the self-descriptions from several of these netizens. 23:40:01 The house owner has just used the emergency light to send a signal to the outside to show that someone is in there. On March 22, a Chongqing netizen with ID "Naked Running Dog 裸奔的狗" began to report live with his mobile telephone from the scene of the nailhouse to the entire nation. This post entitled <Live broadcast: In support of the most awesome Chongqing nailhouse (original) (exciting)> included descriptions as well as a large quantity of photographs that "Naked Running Dog" took at the scene and other illustrations constructed with PhotoShop. The post also had six other videos that were either taken by other netizens at the scene or captured from television broadcasts. Words, photographs, sounds and videos are interlaced in the post. Since it began to report on the case of "the most awesome nailhouse," the post had seen a large number of netizens who wait there by refreshing every so often so that they get the latest news from "Naked Running Dog." "In my memory, this is the most successful case ever (excluding sports events and the CCTV Spring Festival Evening Gala)," said MOP Hodgepodge administrator "Crazy Guy" said to the reporter. At the deadline for this report, the post has been viewed almost 60,000 times with almost 2,000 comments. "My real name is Hu Fei. It's cool, right?" said "Naked Running Dog." He was born in 1983 in Chongqing and he is presently an animation designer. Since he has published his own cartoon drawings often at the MOP Hodgepodge, he got to know the administrators. "On March 17, I was chatting with 'Crazy Guy' on QQ and we happened to bring up the case of the nailhouse. I said that I live only a few hundred meters away from the site. So he immediately asked me to cover it and to dig up as much information as possible." On March 18, "Naked Running Dog" was still thinking about doing a post to re-organize the information so that everything about the "nailhouse" would be included in that one mega-post. "My thought was that there were three types of information: factual, gossip and peripheral. The factual information is something with actual evidence that I can confirm. For example, the nickname of the nailhouse female household is not 'Sister A Qing' but 'Eighth Sister Wu.' There is plenty of gossip, including those from the spectators and netizens. For example, there was the big talk that the developer had gathered 300 men to take action. When I cannot confirm something, I will mark that as coming from netizens or citizens. It will be up to you to decide whether you believe it or not. As for the peripheral information, you can see the road maps, the satellite photographic maps, the traffic road, etc which I had prepared with PhotoShop. A very detailed map guide of mine had been quickly carried by many websites. I thought that it was a lot of fun. Someone who does not know the area could not have done it." After March 18, the nailhouse incident became a key focus for the national media. When the local court ordered forced demolition to begin as of midnight on March 23, there were no reports in the local Chongqing media and the national media reports could not be updated as quickly. "Beginning March 20 and 21, the atmosphere on the Internet was becoming more and more heated. I saw that the gossip and photographs every day were basically updated and then immediately followed by comments: 'Has it been demolished yet? What is happening?' The netizens were all asking that," said "Naked Running Dog." So he decided to change his post into the "direct news broadcast station" that the netizens can now see. "Naked Running Dog" has a smart mobile telephone. From the scene, he can watch and use mobile QQ to send the video to the MOP administrator "Crazy Guy," who makes sure that the entry gets posted on the top of the live broadcast post for the netizens to catch the latest happenings. "Certain 'not-very-harmonious' 'gossip' was not uploaded, such as leaders taking bribes, or relatives of the householder are 'political princelings' and so on. Anyway, I send him everything and he acts as the gatekeeper. For me, the more important thing is to find the best angle to take photographs." "Naked Running Dog" has very simple equipment. He is using a Canon A95 camera. "My own camera was stolen a while ago. I borrowed a camera for the broadcasts." "Naked Running Dog" is satisfied with his photograph. "This is an unusual angle. It can only be gotten by long-time residents such as myself." "Naked Running Dog" was standing on the roof of the two-storey building closest to the nailhouse. There was barely enough room for his two feet and he is standing right over the street by the construction site. "It is very dangerous. If I fall down, I would be dead or crippled. I took a couple of photographs before I retreated. Reporters will never think about doing this. They typically take photographs from the light-rail station." He was quite proud. For the administrator "Crazy Guy," this live broadcast achieved a decent effect, but the equipment needs to be improved. "My idea live broadcasting equipment would be a wireless computer notebook and a camera. The camera can be used to take broadband videos. As soon as it is done, it can be compressed by software and then uploaded to broadband video sites such as UUMM. Then you post it to MOP Hodgepodge. It is entirely feasible to process a five-minute video within 30 minutes." Here is the interview with "Naked Running Dog." Q (yWeekend): Compared to ordinary reporters, you pay attention to different news points? A (Naked Running Dog): Reporters will take a higher starting point, such as being concerned with the "Property Rights Law" behind this incident. I am more like a spectator at the scene and I care about what the spectators care about. I try to connect a very practical matter with my own very practical interests. Also, I have the inclination to gather with a group of other people to create a stir. I do not deny that. A: Many people including myself have seen "forced evictions" and people do follow trends. If Wu Ping is successful this time, a precedent will be established. With so many people paying attention, all future cases will naturally be to our advantage. Q: When you send information back from the scene, will you delete information that is unfavorable to the nailhouse household? A: No. I have published some gossip about the background of Wu Ping. Q: Have you interviewed the principals? For example, did you think about digging out the truth and inside secrets of this case? A: I thought about it. But I cannot get an entry. Should I tell them that I am a voluntary reporter for MOP? I definitely want the truth and the inside story, but I do not have the ability. I can only dig out what I can, and it will be up to everybody to dig out the rest. This is the superiority of the Internet. The Tianya and MOP netizens are all digging hard. Q: Will you continue to pay attention to news incidents and do Internet reports? A: Of course. No matter whether it is about nailhouses or other things, it is a meaningful thing to be a reporter, even though I cannot even be said to be a part-timer. I care mostly about society, livelihood, sports and such matters. I will not do broadcasts on my own blog, and I will not establish a special website. The website traffic at MOP Hodgepodge cannot be matched by personal blogs or websites. If an incident needs to be made known to more people, then it should be published in places where there are more people. If you want to throw a bomb, it should be at a crowd. Tianya was one of the hottest forums for netizen livecasts and discussions of the "most awesome nailhouse." 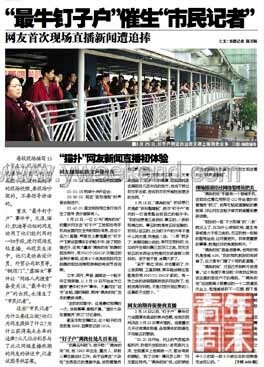 At midnight on March 23 when the forced demolition of the nailhouse was due, netizen "Shujunyuxiu 蜀俊渝秀" began a post entitled <Live photographic/textual reporting of the Chongqing nailhouse> in the Chongqing section of Tianya and it stayed there for four consecutive days. "When I got off work at 18:00 on March 22, I took the light-rail from the Monument of Liberation to the nailhouse scene and I stayed there until March 23. The climax was reached near 24:00 when I estimate about 400 people and reporters being present." The reporting style of "Shujunyuxiu" was different from that of "Naked Running Dog." He did not broadcast live from the scene. When he got home, he would process the photographs of the day with some simple PhotoShop techniques. Then he uploaded those photographs onto the website with some short but sharp commentaries. "Beloved, our future nest won't become like this?" This is the annotation that he made for a photograph of the backs of two lovers who were staring at the nailhouse from the light-rail station. His style was liked by most netizens. Many people followed up with comments using the Chongqing dialect terms for support (扎起 and 顶起) or even the new term 钉起 (='nail up') that has been coined as a result of this case. Apart from MOP and Tianya, there were also live reports from the scene using video, photographs and texts at Sina.com, NetEase.com, KDnet and other forums. The netizens used their computer mice to vote and make their favorite posts red-hot, which draw even more people to participate. In the view of MOP Hodgepodge's leader Du Peiyuan, the simultaneous appearance of so many large-scale live reports at the various forums can be considered a milestone in the history of the development of the Internet in China. "The significance is about the future because this is where the trend is heading." "On March 19, I found the photograph posts on the nailhouse, and the netizens were basically explaining the background of the case as well as an exact location: Yangjiaping in the Jiulongbo district of the city of Chongqing. On March 21, many more media entered. March 23 was the deadline for the forced demolition, and this was the day on which Internet attention reached a peak," said Du Peiyuan as he went through the large number of posts at MOP Hodgepodge. "On the evening of March 22, MOP Hodgepodge had two live broadcast posts. Many netizens stayed up all night to read the news from the scene. As of midnight March 23, those two live broadcast posts had 7,000 or 8,000 comments." At MOP Hodgepodge, it is not a historical high to garner 7,000 or 8,000 comments. "In the China-Japan soccer game at the Asian Cup, the netizens sent in several tens of thousands of comments. But that is of a different nature from the case of the 'most awesome nailhouse.' This is the first time that netizens are sending information live from where the news was happening. And several different websites were doing the same thing at the same time. This is a milestone in the broadcasting history of the Chinese Internet," said Du Puiyuan. In Du Puiyuan's view, the "most awesome nailhouse" was able to give birth to "citizen journalism" because it contained several major factors: the "Property Rights Law" itself (which was brought out during the recently concluded National People's Congress); the coincidence between this "most awesome nailhouse in history" and the "Property Rights Law"; and the highly symbolic deadline (March 23 midnight) for the forced demolition all drew heavy attention within the same period of time.